You can count on needing a supply of salon hand towels for your nail and tanning establishment. But why stick with ordinary white towels when you can have colored salon hand towels instead? Surprise and delight your guests by offering them a rainbow selection of salon hand towels every time they visit. When you need bulk colored cotton hand towels for your salon, spa, team or business, Towel Super Center is here to help. 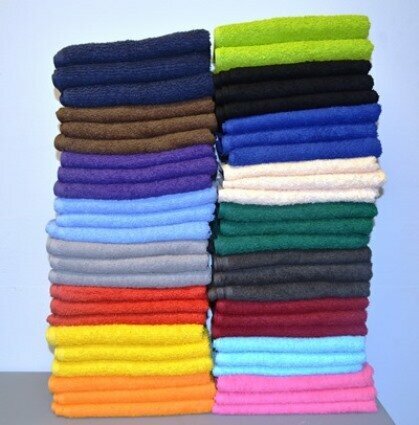 We have a wide selection of colored cotton hand towels in generous 15x25 sizing that’s perfect for your business. Low Prices and Premium Quality at Towel Super Center Towel Super Center is the leading discount towel and linen provider on the web. Want to make every customer's visit to your nail and tanning salon a little more memorable? Find a local embroidery shop and ask them to add your logo to some of your new colored salon hand towels. Every time you use a towel, you'll be conducting a bit of advertising. You might even want to occasionally give away wholesale salon towels with your logo for fundraisers and other events. It's a great way to get the word out about your establishment with a practical item that everyone can use.